Trans-Boundary Deposits, Unitization, Hydrocarbon Resources, Stakeholders, Person Concerned, Unitization Agreements, Interaction, International Experience, Tran-Boundary Resources, Development. In the modern world, in terms of globalization and internationalization of the world economic systems, the formation and development of the international relations play an important role. The conflict of interests of different countries in the field of development of trans-boundary hydrocarbon deposits (THD) is a very relevant issue today due to the strategic focus of the national interests of the countries in favour of owning the resources as an indicator of financial stability and independence, especially when it comes to oil and gas reserves. The term "trans-boundary deposits" is understood in the foreign practice of subsoil use as the deposits that intersect with the various borders-interstate, intrastate, the borders of the subsurface users' plots, as well as other boundaries separating the territories with different legal regimes (Mareeva, 2004). In order to improve the control over the development of THD, the mechanism for unitization was developed, based on the conclusion of an agreement between the countries claiming to operate the hydrodynamically related hydrocarbon deposits or fields (Edilkhanov, 2011). According to the international law, the unitization is the combination of the efforts of two or more owners of subsoil plots for the purpose of development of the entire hydrocarbon deposit (Mareeva, 2003). The unitization agreement, as a normative legal document, provides for the mutual merger agreement of the parties for the purpose of joint operation of the deposit and establishes certain conditions (economic, technological and legal). The basis for the unhindered processing of the raw materials is a clear establishment of the territory of the agreement and the coordinates of the unit's deposit (the subject of the unitization agreement). In addition to the separation and establishment of the specific shares of reserves and, accordingly, the economic effect between the countries, it is important to appoint the independent operator within the framework of unitization to perform the supervision over the development of the field (Ulyanov & Dyachkova, 1998). The undoubted advantage of the unitization agreements is a clear definition of the boundaries and operating conditions of oil and gas deposits at the legal level, taking into account possible sanctions for their violation, allowing to avoid any resource conflicts and to obtain a multilateral economic effect (Ilinova & Cherepovitsyn, 2016). Within the framework of international cooperation on joint development of the trans-boundary deposits, the identification of the main stakeholders of this process and the determination of their immediate interests are of high relevance. The world experience in the development of trans-boundary oil and gas deposits crossed by the interstate borders is considered in this article, the unitization agreements used in the world practice of development of hydrocarbon deposits are assessed and the key stakeholders in the development of such deposits, their role and mutual influence are considered in more detail herein. At the moment, there is a series of approaches to the definition and settlement connected with trans-boundary deposits, which constitute the theoretical base of this study. There are a lot of Russian papers devoted to legal aspects of this issue (Vylegzhanin, 1997; Vylegzhanin, 2001; Mareeva, 2003; Edilkhanov, 2011). The theme of trans-boundary adjustment from political point of view is considered by many foreign authors (Henderson, 2012; Anteasyan, 2013; Bryza, 2013; Gurel et al., 2013; Nathanson, 2012; Nopens, 2013). Many papers present case descriptions related to the unitization and trans-boundary fields and discuss such issues as geopolitics, territorial aspects, energy security, forms of contracts and others. However, there are no research papers focusing specifically on stakeholders of this process, though this topic is relevant. This paper sets out to analyse the main stakeholders of unitization through the analysis of world experience of utilization, to define their interests, influence and the level of interaction. The analysis and evaluation of unitization world experience is carried out based on the Russian and foreign papers (Rubtsova, 2014; Bastida et al., 2007). The legal basis of research is international acts and documents related to utilization. For analysis of practical experience of the countries in the sphere of unitization of trans-boundary fields, we use real contracts which are concluded between different countries, namely: The Agreement between the Government of the United Kingdom of Great Britain and Northern Ireland and the Government of the Kingdom of Norway relating to the delimitation of the continental shelf between the two countries (AGR, 1965), United Kingdom of Great Britain and Northern Ireland and Norway Agreement relating to the operation of the Frigg Field Reservoir and the transmission of gas there from to the United Kingdom (AGR, 1976), Framework Agreement between the Government of the United Kingdom of Great Britain and Northern Ireland and the Government of the Kingdom of Norway concerning Cross-Boundary Petroleum Cooperation (FAGR, 2005), Treaty to Resolve Pending Boundary Differences and Maintain the Rio Grande and Colorado River as the International Boundary between the United Mexican States and the United States of America (TR, 1970), Agreement between the United States of America and the United Mexican States Concerning Trans-boundary Hydrocarbon Reservoirs in the Gulf of Mexico (AGR, 2012), Treaty of Continental shelf in the Persian Gulf between Governments of Iran and Qatar dividing their respective continental shelves in the Persian Gulf (1970). The world experience in conclusion and use of the unitization agreements in the course of hydrocarbon deposit development has been accumulated by now, but it is ambiguous. The analysis of the world experience on the issue under consideration with the identification of the applicant countries for the development of trans-boundary deposits, the main conditions for conclusion of the agreements and the results of unitization (Ilinova & Cherepovitsyn, 2016) are represented in Table 1. Thus, according to the experts (Vylegzhanin, 1997), the agreements on the operation of the Frigg gas field, concluded between Norway and the UK, are the classic successful example of unitization. The maritime boundary between the states was defined as far back as 1965. Following the form of the Frigg Agreement, a number of similar agreements between these countries were signed (Statfjord & Murchison). In 2005, the countries signed the Framework Agreement (FAGR, 2005), consolidating the existing experience of interaction between the countries in this matter. As for the fields in the Gulf of Mexico, the USA and Mexico, in contrast to Norway and the UK, in 2012 signed the general agreement, in contrast to the agreement on individual deposits, inclining the countries to cooperation and mutual interest. As for the Timor Gap Treaty, concluded between Australia and Indonesia, it is much broader than the Frigg Field Agreement. This agreement establishes the licensing system of a new type in the agreed zone, which is absolutely independent of the licensing systems of each of the two states. The analysis of the agreements on the continental deposit between Argentina and Uruguay, as well as on the deposits in the East China Sea and on the shelf of the Persian Gulf is presented in Table 1. The recognized benchmarks of the unitization agreements are the Australia-Indonesia Timor Gap Treaty and the agreement on joint development of the oil deposit in the Gulf of Thailand (The Joint Development Agreement of 1990 between Thailand, Malaysia, Cambodia and Vietnam) due to the high degree of elaboration and detailedness of the issues related to taxation, product sharing, environmental audit, rights and obligations of the parties as a whole. Based on the analysis of the world experience in the field of the unitization of THD, as well as the review of the above-mentioned treaties and model unitization agreements of the American Petroleum Institute (The Agreements of the American Petroleum Institute for Trans-boundary Deposits (1961)), it is possible to single out such key players in unitization as the state (state agencies), the license holders (The mining companies conducting the development of the deposit), the unit operator, appointed based on the agreement of all parties, the unitization committee, the investors, as well as the media and the community. Table 2 presents the analysis of the main stakeholders in the THD development, acting on the basis of the unitization mechanism. The complexity of the stakeholder interaction in this case lies in the presence of several parties seeking simultaneously to realize their own interests aimed at possessing the largest amount of reserves while maximizing the economic effect and minimizing the costs. Given the complexity of the offshore projects (Carayannis & Cherepovitsyn, 2017) associated with the unfavourable conditions in the Arctic region, the need to use the unique technologies for exploration and extraction of raw materials, which in turn requires considerable financial resources and is associated with a number of serious risks, the disagreements between the parties to the Treaty can vary significantly from the coordination of the development system to the production sharing. An important role in the development of trans-boundary deposits is played by the state, the functions of which are indicated in Table 2. As part of the consideration of joint THD development for license holders, it is necessary to note the sharing of the financial investments, tax and other liabilities, as well as the technological risks between the participants, which is an absolute advantage due to the significant capital intensity of oil and gas projects. The insurance against unfair conduct of the parties to the agreement is performed on a legal basis by conclusion of the additional agreements. The unit operator, representing the interests of the parties and the appointed unitization commission, acting in compliance with the international standards, controls the fulfilment of the main and additional conditions of the agreements and informs the relevant government agencies (Boyarko & Zolotenkov, 2015; Borges et al., 2014; Dzhunsova, 2012). An important role is played also by the investors of such projects, whose main goal is traditionally to maximize the profits and to minimize the relevant risks, as well as the media and the community, also pursuing their goals. Where K is the indicator of stakeholder assessment is the relative value of the functional indicator of the stakeholder assessment; is the specific weight of the stakeholder assessment criterion (Skachkov & Skachkova, 2016). The results of the calculations are shown in Figure 1 in the form of a multilateral chart. 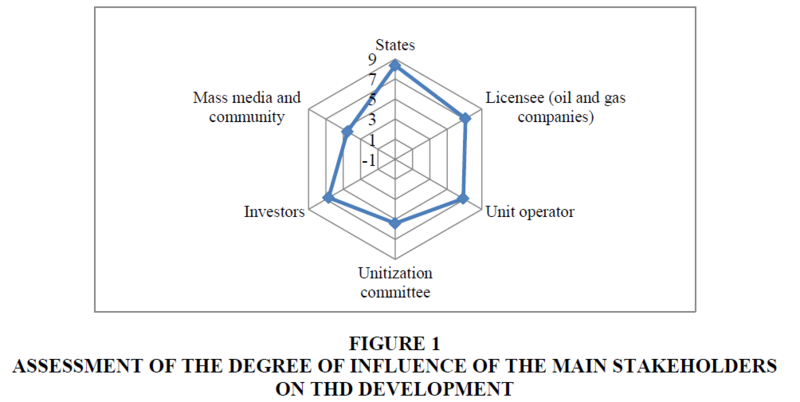 Figure 1.Assessment Of The Degree Of Influence Of The Main Stakeholders On Thd Development. The greatest influence is exerted by the government agencies and license holders with the greatest degree of interest in the implementation of the similar projects and a significant potential for participation and interaction. The unit operator is also an important element in the stakeholder system, being a link between two or more parties in legal, economic and other aspects. The coordination and monitoring of compliance with the international standards and the country's subsoil use documents is performed by the unitization committee, which is entitled to receive the information on the progress and on-going works on the project. Nevertheless, the decision on its establishment is not always taken. Despite the fact that investors do not make the decision related to the regulation of the unitization conditions, their role in the implementation of the large-scale projects for the THD development is very significant in terms of the above capital intensity of such projects. That is why they play a significant role in assessment of the stakeholders. The media and the community can also be defined as the party to the interaction, with its own specific interests and position. In this aspect, the achievement of balance is facilitated by the availability of the information, as well as by the social interaction, the implementation of international standards of social responsibility. Figure 2.Interaction Of The Stakeholders In The Process Of Unitization . Based on the studies, a structural chart of key stakeholders, presented in Figure 2, is drawn up. Within the scope of the interaction areas, the following main components are identified: The legal and the economic and socio-economic spheres, which are interacting and mutually complementary. The central element of such interaction is the direct coordination of the unitization agreement, the terms of which regulates subsequently the development of the hydrocarbon deposit and determines the allocation of the resources for each individual party. As part of the implementation of the unitization, Russia has certain experience and some legal developments (the Treaty between the Russian Federation and the Kingdom of Norway, the Agreement between the Government of the Russian Federation and the Government of the Republic of Kazakhstan, Federal Law No. 225-FZ "On Production Sharing Agreements", Federal Law No. 115-FZ "On Concession Agreements", Federal Law No. 187-FZ "On the Continental Shelf of the Russian Federation" and others). Thus, the legal regulation of the exploitation of the Khvalynskoye oil and gas deposit located on the border of the Russian Federation and Kazakhstan was carried out on the basis of mutual cooperation through the implementation of the agreement on joint development of the deposit in approved equal shares (50/50%). Within the framework of the agreement, a single operator was appointed to oversee the operation in the person of LUKOIL company. The result of introduction of the unitization mechanism was the mutually beneficial exploitation of the deposit on an equitable basis, which led to a positive economic effect for both participating countries (Rubtsova, 2014). The similar agreements are now being considered in the framework of international cooperation between Russia and Norway on the exploitation of the THD. At the same time, a necessary condition within the framework of possible unitization is the preservation of spheres of influence and national interests of the main participants. 13. The success of THD development can increase considerably in the presence of arrangements on timely exchange of information between main participants and carrying out joint scientific research. Thus, the foreign experience in development of the THD shows that subsoil users are generally interested in clear regulation of the process of THD development. The state is also interested in such regulation. In its absence, a number of rather complex issues and contradictions arise, reducing the efficiency of field operations for all major stakeholders of this process. The achievement of the consensus among the states involved in unitization is laborious and requires significant time and financial expenditures; moreover, in the final analysis, it is not always possible. For example, the coordination of the agreement on the gulf of Thailand took about 11 years (Rubtsova, 2014). At the same time, even if the parties reach an agreement, there is a possibility of unfair conduct of the partners towards maximizing their own economic effect. The territorial distribution of shares for the right to develop the trans-boundary resources may be incorrect, since there are a number of other criteria, such as the countries technological and the economic readiness to conduct the operations for exploitation of the deposit, various mining and geological conditions in different countries and others. Moreover, the problem may be the reluctance of one of the parties to develop the deposit at a given time based on national interests or current market conditions. Despite the experience, it can be concluded that the mechanism for signing the unitization agreements is developed quite poorly, including in part of interaction among the main stakeholders of this process. The reference point is still the agreements of different countries, which have been developed during a long period of time using the "trial and error" method. Thus, the analysis and assessment of the unitization relations used in world practice today is one of the priority directions for the development of the regulatory and legal framework in the sphere of subsoil use. Russia, as a country with a significant resource potential, requires the development of its own regulatory and legal framework on this issue. Currently, the definition of the potential for the interaction between the main stakeholders of this process in terms of their main interests and the degree of influence on each other is of high relevance. Each country, in the territory of which the reserves of THD are located, requires the determination of its own position on the development of such deposits by developing its own rules and documents, determining the policy within the framework of international cooperation on these issues, taking into account the interests of the main stakeholders, both on its own part and on the part of its partners. A prerequisite is a clear definition of the areas and levels of interaction of stakeholders involved in this process. Edilkhanov, U.S. (2011). Pravovoe ponyatie i sushchnost transgranichnykh mestorozhdenii poleznykh iskopaemykh [Legal concept and essence of trans-boundary mineral deposits]. Trudy nefti i gaza im. I.M. Gubkina, 3(264), 170-176. Mareeva, S.Y. (2003). Mezhdunarodnye yunitizatsionnye soglasheniya kak sposob zashchity natsional'nykh interesov Rossii na transgranichnykh mestorozhdeniyakh [International unitization agreements as a way of protecting Russia's national interests on trans-boundary deposits]. Mineralnye resursy Rossii: Ekonomika i upravlenie, 5-6, 77-84. Boyarko, G.Y. & Zolotenkov, Y.V. (2015). O sovershenstvovanii upravleniya razrabotkoi transgranichnykh mestorozhdenii poleznykh iskopaemykh [On improving the management of trans-boundary mineral deposit development]. Gorniy zhurnal, 11(26), 8-16. Ilinova, A.A. & Cherepovitsyn, A.E. (2016). Assessment of the merits and demerits of the unitization agreements used in the world practice in the development of oil and gas deposits. Economics and Entrepreneurship, 10-3(75-3), 697-700. Rubtsova, A.I. (2014). Livano-Izrailskii leviafan i mirovoi opyt razresheniya sporov po transgranichnym mestorozhdeniyam uglevodoroda [Lebanon-Israel leviathan and the world experience in resolving the disputes on transboundary hydrocarbon deposits]. Uchenie zapiski Kazanskogo Universiteta, 4, 209-216. Vylegzhanin, A.N. (1997). Prava na morskie prirodnye resursy [Rights to sea natural resources]. Khozyaistvo i pravo, 5. Vylegzhanin, A.N. (2001). Morskie prirodnye resursy (mezhdunarodno-pravovoi rezhim) [Sea natural resources (International legal mode)]. Moscow: Council for the study of productive forces of the ministry of economic development of Russian Federation and RAS. Bastida, A.E., Ifesi-Okoye, A., Mahmud, S., Ross, J. & Walde, T. (2007). Cross-border unitization and joint development agreements: An international law perspective. Unitization EIC Edits. Abbasly, G.A. (2008). Mezhdunarodno-pravovye problemy razgranicheniya morskikh prostranstv: Avtoref. diss. na soisk.uch. st. kand. yur. Nauk [International legal problems of delimitation of sea areas]. Ph.D. Thesis Abstract, Moscow. Dyachkova, E.A. & Ulyanov, V. (1998). Forma sotrudnichestva pri osvoenii transgranichnykh resursov nefti i gaza [The form of cooperation in the development of trans-boundary oil and gas resources]. Pravo, 10-11(26), 11-17. Lyons, Y. (2012). Trans-boundary pollution from offshore oil and gas activities in the seas of Southeast Asia. In trans-boundary environmental governance: Inland, coastal and marine perspectives (pp. 167-202). University of Wollongong, Australia: Ashgate Publishing Ltd.
Weaver, J.L. (2013).Unitization of oil and gas fields in Texas: A study of legislative, administrative and judicial policies. U.S. University of Houston Law Centre. Borges, C., Szklo, A. &Bucheb, J.A. (2014). Windfall profits arising from the subadditivity of costs after unitization and compliance with minimum local content requirements in Brazilian deepwater offshore oil fields. World Energy Law and Business, 7(4), 390-406. Dzhunsova, D.N. (2012). Sovremennyi mezhdunarodno-pravovoi rezhim Severnogo Ledovitogo okeana i pribrezhnykh morei Arkticheskikh gosudarstv [The modern international legal regime of the Arctic Ocean and the Coastal Seas of the Arctic States]. Aktualnye problemy ekonomiki i prava, 1. Skachkov, A.N. & Skachkova, I.A. (2016). Otsenka i vybor steikkholderov predpriyatiya [Assessment and selection of the enterprise stakeholders]. Otkrytye informatsionnye i kompyuternye integrirovannye tekhnologii, 72, 164-169.